Mental health services are a critical need across Allegany, Cattaraugus and Chautauqua counties. This is especially true for our local EMS responders, who often suffer traumatic psychological and emotional wounds alongside the people they care for. I’d like to thank the John R. Oishei Foundation for funding a Mental Health First Aid (MHFA) training program here at STHCS. Oishei’s support will allow us this spring to educate six EMS instructors (two per county) in MHFA strategies for our EMS agencies and communities. We will address mental health issues primarily for EMS responders that, left untreated, cause risks for poor health outcomes and even death by suicide. Sometimes people just need someone to listen to their pain and direct them to counseling or other interventions. To reach the greatest number of people who are struggling, we must first increase our local capacity through training to respond to these needs. I’m so proud of our EMS recruitment video promoting our Everyday Heroes program. 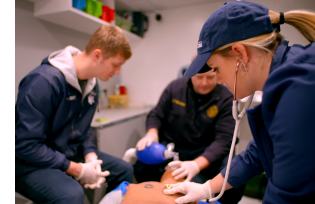 In it, a few of our local providers discuss what drives them as EMS responders and how the course prepared them for the emergency medical field. It’s been exciting to see all of the positive responses on social media. I hope more people take notice and consider a rewarding career as a professional or volunteer EMT. The need for qualified personnel never ends. I’d like to thank EMTs Abbe Mostowy and Geoffrey Broadbent and instructor Lt. Tim Richardson of the Olean City Fire Department for participating in the filming. If you or someone you know is interested in taking a course to become a certified EMT, contact us here or email STEMS Coordinator Alicia Broadbent at stems@sthcs.org.